With all the warm weather and plants emerging from their winter nap, it follows that we will need to begin watering. With watering comes the need to use the outdoor faucets (hose bibs) and if proper precautions were not taken there may be hidden damage to your pipes. Make sure when you use your hose bibs for the first time that you check to make sure they don’t leak inside the wall. The frost proof variety of hose bibs turn the water off on the warm in winter side of the wall but if the hose or any attachment was left on the hose bib it can prevent water from draining out of the pipe inside the wall which can then freeze and burst. The easy way to test for damage is to simply attach a hose with a sprayer and on turn the water at the hose bib until water flows freely from the end of the hose then shut off the hose end sprayer to stop the water with pressure still on the hose. Listen and watch for water at the wall surrounding the hose bib. Silence is golden! But if you hear water or see water exiting the wall you have a problem. Turn off the hose bib and relieve the pressure to stop the leak then call your plumber. 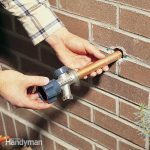 Unless you are a very experience DIY type, replacing the valve buried deep inside the wall can be a bit tricky and if you are not careful things can go from bad to worse very quickly since it is easy to damage the house pipe inside the wall and cause a leak that requires the entire house water system to remain off until the repair is completed.